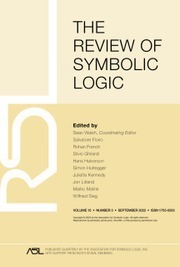 - Applications of logic to the sciences, such as computer science, cognitive science, and linguistics; and logical results addressing foundational issues in the sciences. SEVENTEENTH-CENTURY SCHOLASTIC SYLLOGISTICS. BETWEEN LOGIC AND MATHEMATICS?